“Son of David” as an anachronism (or metaphor?) in the Gospels, Paul and Acts? It would thus appear that the supposedly standard Jewish ideas or expectations of the messiah are a flimsy foundation indeed from which to explain early Christian understanding of Jesus. Now in my previous post I pointed out that Horsley said the idea of a Davidic messiah was very rare and confined to literary elites in the time prior to Jesus. Here I look at his discussion of these exceptions. Did the Jews before Christ expect a national Messiah? The answer is, I think, no. 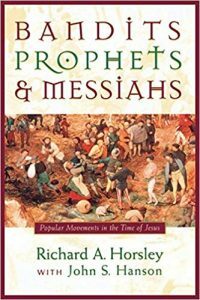 In this post I quote a few sections from Professor Richard Horsley‘s work Bandits, Prophets & Messiahs: Popular Movements in the Time of Jesus. Horsley notes that common views today about ancient Jewish beliefs about the messiah have been “heavily influenced by western christological doctrine.” (p. 89) That’s never a good sign. Religious bias getting in the way again?